Bott cubio complete cupboard kit. cupboards. 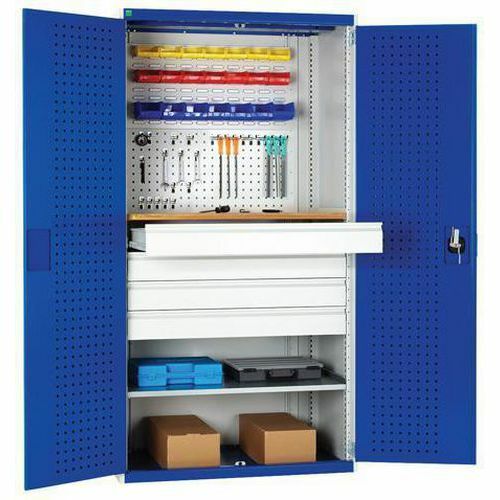 Heavy duty tool cupboard with an overall load capacity of 1.5 ton and 10 year guarantee. Double locking doors with inner perfo storage panelling, for secure and flexible storage options. Louvre back-panels are suitable for attaching plastic storage bins (included) to suit your needs. Perforated panelling can be used with tool holders (included) for additional storage. Robust shelves and drawers are adjustable on 25mm pitch. All drawers have 100% roller bearing slides for ease of action under full loads, and allowing easy access to the entire drawer. A single storage solution for a wide variety of industrial and commercial needs. Please note: pictured tools not included. Drawer HxWxD: 125x549x968mm. 1 x shelf. 1 x wood top - beech multiplex. 1 x perfo back panel. 1 x louvre back panel. 20 piece hook kit. 21 piece bin set included.